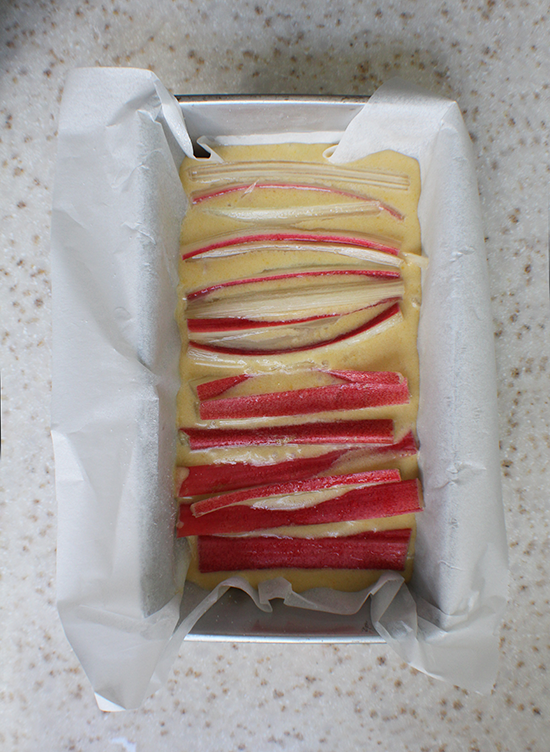 Ready for rhubarb: baked & pickled. Rhubarb comes and goes very quickly. It’s fleeting, rhubarb season. You simply cannot just walk into a store here and get rhubarb any time you want during the growing season. 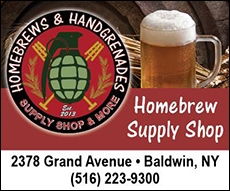 It sells out of the markets & supermarkets almost immediately. My mother absolutely LOVES rhubarb, and the season usually coincides with Mother’s Day, so I try and get some to make her something special. When I find it, I try to grab it. 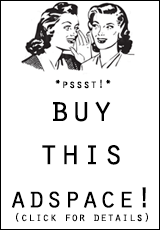 But if its not the greatest quality, or if its on the pricey side, I skip it. The stalk I bought for these two recipes was pretty huge, and I paid a little over $2.00 for it. It went into these pickles and also the next recipe which you’ll see in a few days (so keep that in mind). So yes, in this post, it’s a two-for-one. 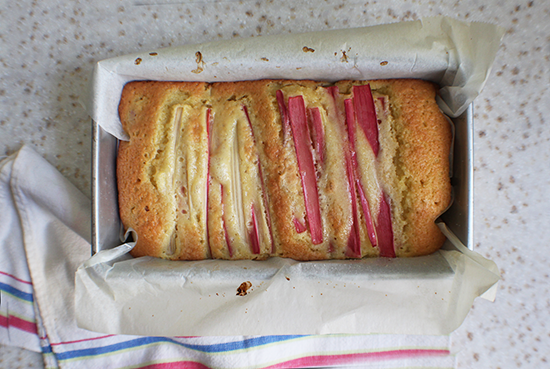 One rhubarb cake recipe, and one pickled rhubarb recipe. First, the cake! Rhubarb is really, really pretty. There are two main kinds; the bright pinkish red kind (this one) and the light pink and green kind. And then there are a bunch in between, of course, but those are the two main color types you’ll find in your store/market. Both colors are fine for any purpose, so long as you be sure to cut off all the leaves, if they come with them still attached. Rhubarb leaves are poisonous! This is especially important to remember if you buy your stalks from a farmer or a farmer’s market, or get them from someone who grows it. I know the brighter pink ones are more “attractive” aesthetically, but the pinkish/green ones can be very pretty too. I like to use a mix if I can find both. This cake really isn’t anything crazy special. Really, it’s just a vanilla cake with sliced rhubarb on top, and some chopped rhubarb studded throughout. It’s not rocket science- believe me. 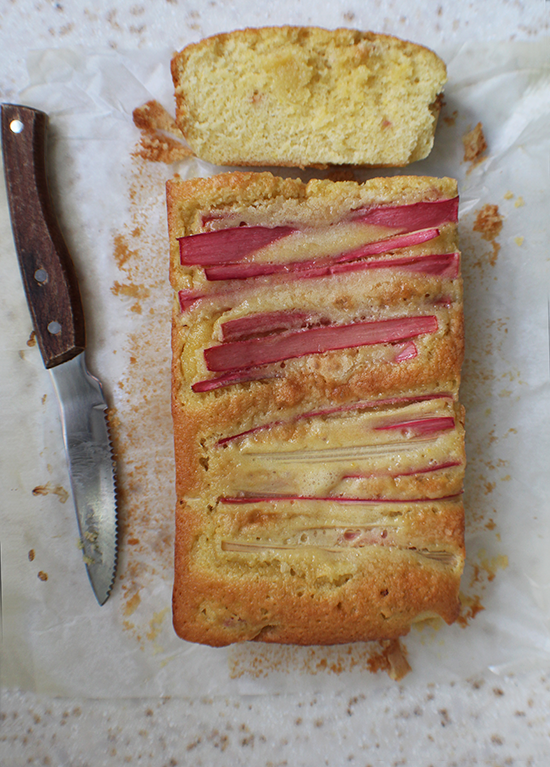 But if you love rhubarb, you’ll love it. So maybe it is special. Lay the stalks in the pan in the order you’ll be placing them on the cake, just to see how many you’ll need, etc. Get the placement right. I did mine in a kind of color order because I have mental problems. Any extra stalks that don’t fit should be chopped and tossed into the batter (I only had two small extra pieces so I don’t have a lot of little bits in my cake). Take them out of the pan and soak them in a bowl in a little water with 1/2 cup sugar to keep them soft & pliable. Preheat oven to 350 degrees F. Grease a 9″ x 5″ loaf pan and add a piece of parchment to ease removal. In medium bowl, combine flour, baking powder and salt and set aside. In the bowl of a stand mixer, mix 1 1/4 cup sugar, eggs and vanilla for a few minutes. With machine running, pour butter in in a slow and steady stream. Transfer egg mixture to large bowl and sift in flour mixture in 3 parts. Incorporate flour gently, until just combined, using a large whisk. 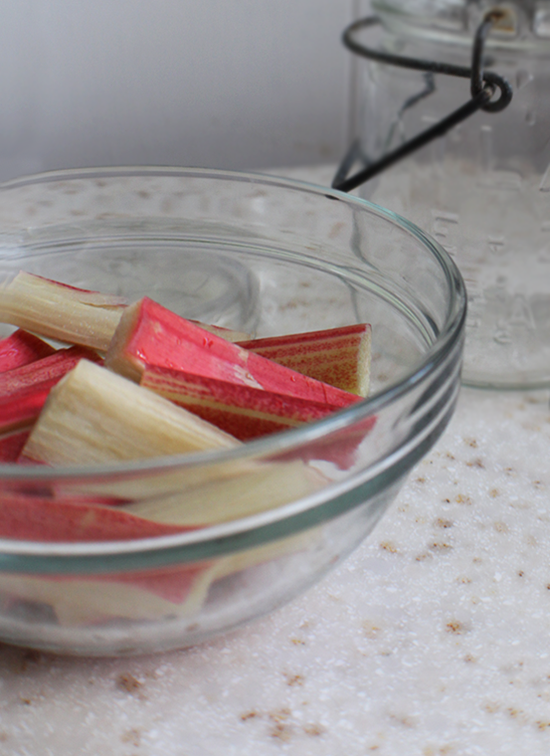 Remove rhubarb from water & sugar mixture and pat dry thoroughly with paper towels. Pour the cake batter into prepared pan, and gently add rhubarb stalks to the top. It’s okay if some start to sink in. Sprinkle top with remaining tablespoon sugar. Bake for 15 minutes. Lower oven temperature to 325 degrees F and bake until deep golden brown and tester comes out clean. It should take about 35-40 minutes. Rotate pan halfway through the baking time. Cool in pan for 10 minutes, unmold and let cool completely on a wire rack. To be honest, this cake would be AMAZING with some sliced almonds on top as well. I wish I had had some. Dammit. And ice cream. Oh, some vanilla bean ice cream on top would be sweet… no pun intended. 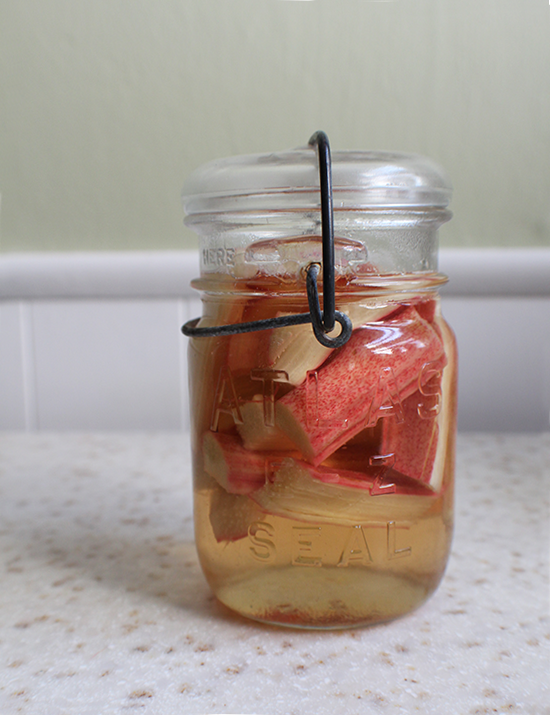 Pickled rhubarb. Yeah, I know. If you’re not either a food blogger, a “foodie” (cringe) or a die-hard pickle lover, you’re probably thinking NO WAY. But it’s a thing, I swear. And it’s part one in my two part recipe series (haha, listen to me… a series… it’s a freakin’ blog post) about being ready for rhubarb. This is a savory transformation of rhubarb, best served alongside pork or chicken, or even grilled fish. It’s also excellent served with cheese and charcuterie platters. And you could even slice ’em real thin and serve ’em on a salad with fresh berries, or you can make a more involved salad, like this one with roasted beets and gorgonzola. Boil vinegar with sugar, salt, ginger and spices in a medium saucepan until sugar is dissolved, about 5 min. 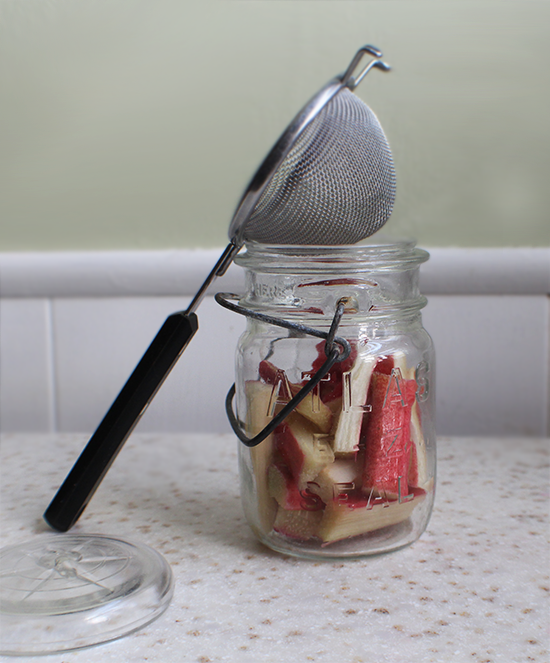 Strain out and discard the solids (I actually kept a few thin slices of ginger and added them into the jars). Set aside. 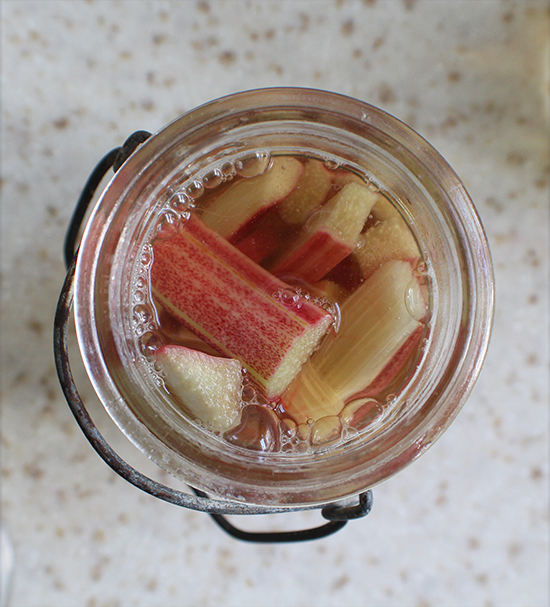 Pack rhubarb into 2 pint jars. Pour hot liquid into jars, filling until it reaches 1/2 in. under the rim. 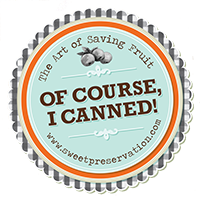 Screw on lids and leave at room temperature overnight to let flavors develop, then refrigerate. Opened jars will keep for up to 1 month, refrigerated. 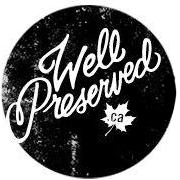 Now for the disclaimer: do not use vintage bail-top jars for canning! This recipe is a refrigerator-type pickle recipe, so it’s fine. But do not attempt to place these in a pressure canner or process them in a waterbath. We good? Good. 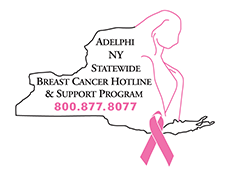 Suggestions for use: cake- serve with ice cream or whipped cream, add almonds or use almond extract, sprinkle with confectioner’s sugar. pickles- serve with grilled chicken or fish, chop up and add to a salad, serve on a sandwich, serve with cheese and cured meats as an appetizer or snack. Sources & credits: aluminum loaf cake pan; vintage, ATLAS E-Z Seal jar; vintage, striped tea towel; vintage, glass mixing bowl; Williams-Sonoma. Previous Post Friday Fifteen: we’re back, and it’s SPRINGTIME! Next Post A simple simple syrup & vodka cocktail, please. 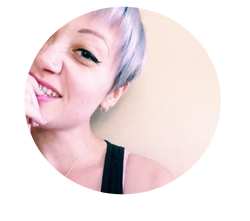 you make running a blog look easy. The full look of your website is wonderful, as well as the content!